Explore the roots of rap in this stunning, rhyming, triple-timing picture book! The roots of rap and the history of hip-hop have origins that precede DJ Kool Herc and Grandmaster Flash. Kids will learn about how it evolved from folktales, spirituals, and poetry, to the showmanship of James Brown, to the culture of graffiti art and break dancing that formed around the art form and gave birth to the musical artists we know today. Written in lyrical rhythm by award-winning author and poet Carole Boston Weatherford and complete with flowing, vibrant illustrations by Frank Morrison, this book beautifully illustrates how hip-hop is a language spoken the whole world 'round, it and features a foreward by Swizz Beatz, a Grammy Award winning American hip-hop rapper, DJ, and record producer. Carole Boston Weatherford is an award-winning nonfiction children's book author. Her books have received numerous accolades, including a Caldecott Honor for Moses: When Harriet Tubman Led Her People to Freedom, a Coretta Scott King Award Honor for Becoming Billie Holiday, and both a Caldecott Honor and Coretta Scott King Honor for Freedom in Congo Square, as well as the NAACP's Image Award. She is currently a professor of English at Fayetteville State University in North Carolina where she created a hip-hop course. Find out more about her at cbweatherford.com. Frank Morrison was born in Massachusetts and moved to New Jersey at an early age. He grew up during the early days of rap music, graffiti, and break dancing. A well-known graffiti artist and also an accomplished break-dancer, he was actually part of the Sugar Hill Gang's dance entourage. It was during one of the group's European tours he got a chance to visit the Louvre in Paris and was so intrigued by all the magnificent art that he decided to return to his roots and become an artist. His talent and hard work paid off with over 20 illustrated children's books, including the Coretta Scott King/John Steptoe Award winner, Jazzy Miz Mozetta, and the Coretta Scott King Illustrator Honor book, Little Melba and Her Big Trombone. Carole Boston Weatherford's 16 bars of homage to the history of hip-hop accompany the celebrated illustrator Frank Morrison's pulsing and vibrant images, which not only convey the development of hip-hop, they dance on the page. Carole Boston Weatherford, once again, delivers a resounding testament and reminder, that hip-hop is a flavorful slice of larger cultural cake. And to be hip-hop-to truly be it-we must remember that we are also funk, jazz, soul, folktale, and poetry. We must remember that . . . we are who we are! 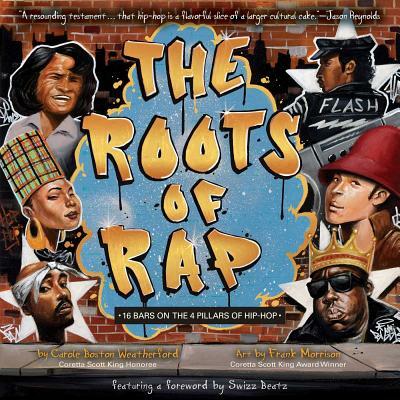 Starting with its attention-getting cover, this picture book does an excellent job of capturing the essence of rap . . . This tribute to hip hop culture will appeal to a wide audience, and practically demands multiple readings. No way around it, this book is supa-dupa fly, with lush illustrations anchored in signature hip-hop iconography for the future of the global hip-hop nation. With short, rhyming lines and dramatic portraits of performers, the creative team behind How Sweet the Sound: The Story of Amazing Grace offers a dynamic introduction to hip-hop. . . . This artful introduction to one of the most influential cultural movements of the 20th century pulses with the energy and rhythm of its subject.